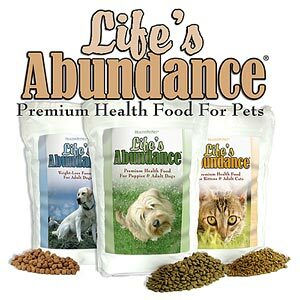 Life’s Abundance Premium Health Food is made with select ingredients, including high-quality chicken and catfish meals, whole grains, nutritious vegetables and fruits, omega fatty acids and much more. We never use corn or wheat products and we never use artificial flavors or colors. Life’s Abundance has developed three unique supplement formulas to target specific needs: Agility for healthy joints, Skin & Coat for healthy skin and a glossy coat, and Wellness Food Supplement for Dogs for overall health.